For all the job seeking applicants get the news job from Ministry of Planning Development & Reform Jobs July 2017 pc.gov.pk. 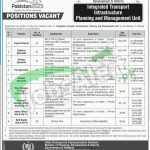 Applications are being offered from Ministry of Planning Development & Reform for " Integrated Transport Infrastructure Planning & Management Unit" the services of eligible, caliber and well disciplined applicants are required to apply for the following posts which are entitled as (Project Director, Highway Specialist, Railway Specialist, Port Specialist, Aviation Specialist, Data Manager/IT Expert, Accounts Manager/Officer, Admin Officer & Naib Qasids) are the posts which needs to be filled with overall qualification of MS/Ph.D, Masters, MBA & Primary qualification is required. Applicants should be having the degree recognized by HEC and relevant expertise are needed to apply for such posts. Attractive salary package will be paid to the applicants with brilliant atmosphere. All the willing applicants who are willing to apply for such posts so be the first one to apply and get employed. Now, I will let you know about it's further details below. Ministry of Planning Development & Reform is the Federal Govt body which is held responsible to carry out the planning and development works through different projects and the Planning Commission which is working under this is undertakes research studies and state policy development initiatives for the growth of national economy and the expansion of the public and state infrastructure of the country in tandem with the Ministry of Finance (MoF). So, being a Govt entity it offers Govt jobs of different level. Applicants are required to apply on the prescribed proforma which can be downloaded from the official site and one can send the filled application to the given address. Last date for applying is 31st July 2017. Candidates working Government Sector should apply through proper channel. Only shortlisted candidates will be called for test / interview and no TA/DA will be provided. Candidates are advised to bring original documents at the time of interview. Address: Chief (Transport & Communication Section), Ministry of Planning Development and Reform, Govt of Pakistan P Block, Pak Secretariat, Islamabad.